Y’all after my Apple's birth 6 years ago I shelved painting. I had been painting for shows, calendars, cards, commissions and three kids under 3 years old combined with where life had us led me to a pause. A long one. Last week as I started pulling out paintbrushes and watercolors and worn down brushes I was thinking about how grateful I was that I gave myself permission to step away for a season. Got out my paint, I put on a good playlist and it felt right. Years later and I hadn’t said goodbye after all, just see you in a bit. 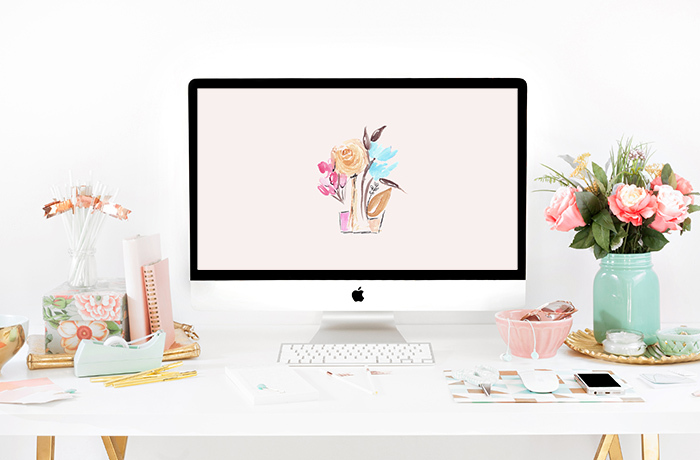 Grab your free wallpaper downloads by entering your email below - they'll be sent right to you! Creating art has always been part of who I am. Finding quiet moments to let me imagination come to life on paper and canvas has been so life giving to me. I took a step back from that a few years ago as I explored other things. I grew my business and focused on my little ones. I had to give myself permission to do that, to shelve it for a bit, but I always knew I’d come back to it. If you’re a creative, you know that feeling. Ideas coming to life, inspiration all around you, wanting to make it something real - something you can see and touch and feel. I wanted to bring that to you. As I tap back into that part of who I am, as I start to create to my art again, I am turning it into free wallpapers just for you! You can use them on your desktop, laptop, phone… just little, colorful reminders of the beauty all around us.